If a physical disability is preventing access to your home or commercial property James R Pitcairn offers residential and commerical wheelchair lifts and verticle platform lifts for your accessibility solution. If you or a loved one requires the use of a wheelchair or motorized scooter, stairways and steps should not prevent you from living normal access. Regain total access to all areas of your home with a residential wheelchair lift. Get back to the comfort and freedom you long for with a cutting edge vertical platform lift for your home. Wheelchair lifts for the home will bring back the comfort and happiness that you found when you first moved in. Don’t let life’s changes make your staircase an enemy, put James R. Pitcairn on the job and equip your home with the residential lift that is perfect for your situation. With James R. Pitcairn and top of the line Savaria wheelchair lift products, there will be no “difficult way” around your home. Wheelchair lifts provide a convenient and comfortable means of maneuvering up and down stairs while remaining seated in your wheelchair or scooter. 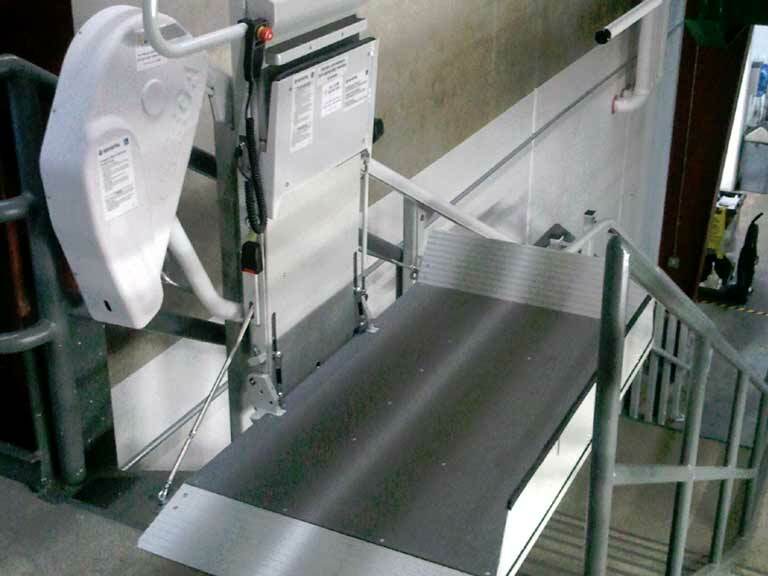 With an easy-to-use fold out platform that holds your device in place, wheelchair lifts smoothly bring you up or down stairs on a durable track system. Never again feel confined to one area of your home due to a staircase.